Projector Trends: Less ladder climbing, less lamps! What’s the biggest complaint about classroom projectors? In a recent poll, 64% of projector users say it’s the Lamps. The lamps lose brightness and need to be replaced, or they stop working and need to be replaced. Not only do you lose productivity without your classroom projector (how many teachers can teach without a projector these days? ), the cost of a replacement lamp is expensive, as well as the cost of someone getting up on a ladder and replacing that lamp. Maintenance for lamp projectors is also an issue. Not only do lamp projectors require costly replacement lamps every year or two, they also needed frequent air filter changes and cleaning. Since projection lamps run very hot, the LCD or DLP elements, power supplies and other internal components tend to deteriorate rapidly, further limiting the useful life of the projector. Some schools were so aggravated with lamps and the constant maintenance for their lamp projectors that they switched to flat panel displays, sacrificing screen size for reliability. But even though flat panels are getting larger (84 inches and up now); they are still nowhere near the 20 foot widths you can normally get from a projector. While the 84” screen size may work fine in smaller rooms, students can have difficulty reading text on the smaller flat panels from the back of a larger classroom. As LampFree projector pricing has decreased over the last few years some of the schools that switched to flat panels are now switching back to projectors. For other schools going LampFree was a better solution right from the start. Having a LampFree projector means no more lamps to replace, no more filters to replace, less down time, lower maintenance costs (less ladder climbing…) and now they are smaller, lighter, and brighter than ever. While lamps on traditional lamp projectors lose brightness between 1,000 and 3,000 hours, the light sources for many LampFree projectors are rated for up to 20,000 hours with minimal degradation in brightness. That means your LampFree projector could last over 10 years, based on an average six hours of use a day during a 180-day school year, without ever having to get out the ladder and change a lamp. Another advantage of going LampFree is no harmful Mercury. Mercury is a highly toxic element that is hazardous to human health and to the environment. The adverse effects of mercury poisoning cannot be understated. Although the use of mercury is widely prohibited worldwide today, this hazardous substance continues to be employed as a light source for conventional projector lamps. LampFree projectors have no Mercury and are better for the environment. Casio, a company ahead of the times, has already completely eliminated the use of mercury in its projectors, starting with the world’s first “Green Slim” LampFree projectors in 2010 and now their entire projector assortment is LampFree. 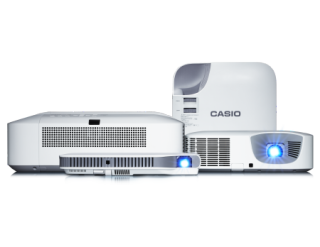 In addition, Casio LampFree projectors consume less energy, up to 50% less electricity when compared to conventional lamp projectors, have no expensive replacement lamps or filters to replace, and since they require minimal maintenance, they require minimal labor costs to maintain. When you add up the original purchase price, the cost of replacement lamps, replacement filters, labor costs, and higher energy usage, LampFree projectors cost much less over the 20,000 hour life of your projector. So it’s not a big surprise that more and more schools are choosing LampFree projectors. According to PMA data, there is a growing trend away from lamp projectors and last year more than 23% of all projectors sold were LampFree. PMA is predicting that by the year 2020 38% of all projectors sold in the US will be LampFree.